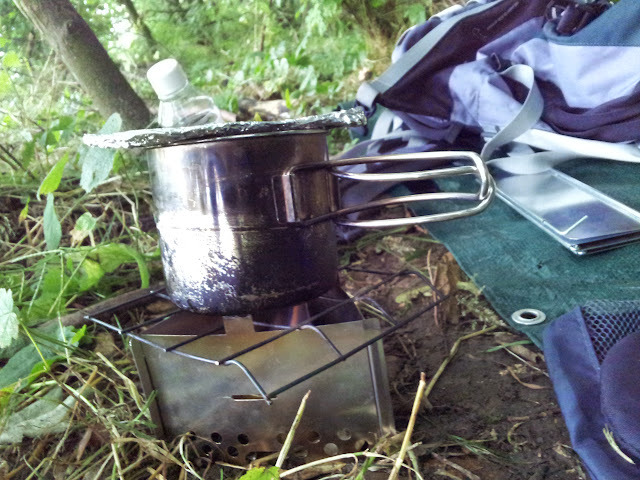 It was mid-July and so far I had enjoyed only one wild camp since the start of the year. And then, unannounced, a completely free weekend turned up. The week prior to the camp I nervously watched cruel weather fronts move up, down, and across the south-east; rain and cloud; seemingly a typical English summer, alas. It didn’t look good for the weekend, and then suddenly, a break in the gloom, happy smiling suns on the weather website, the camp was on. I took the train south to a sleepy Hertfordshire village and twenty minutes later the wood, let’s call it Barking Fox wood, was there, all inviting on the horizon. It was early evening as I approached the wood. 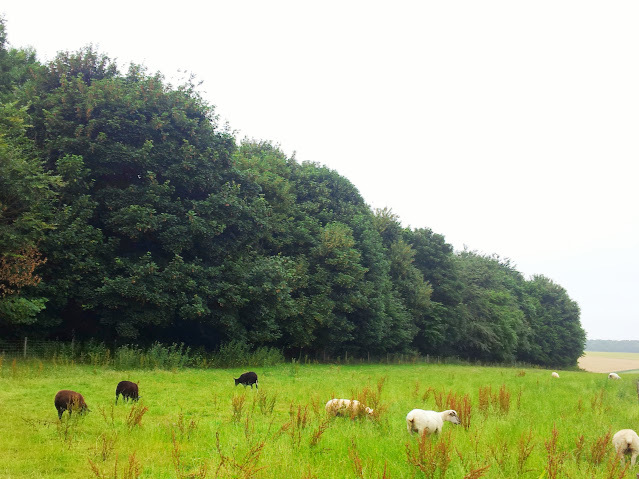 Sheep nibbled lazily at grass, ignoring me as I strode by. 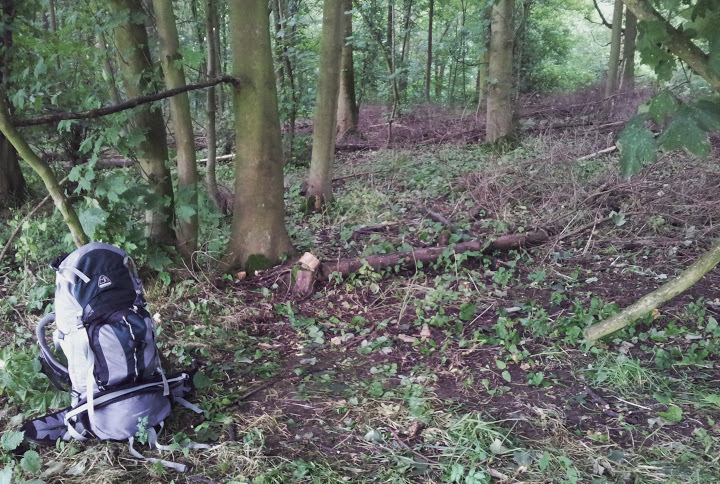 As I entered the wood I started to feel the usual apprehension of a wild camper…did anyone see me go into the wood? Would they come for me when night fell? Stupid thoughts, I banished them and whistled a merry tune instead. I left the path and dove deep into the wood, heading for the edge furthest from the footpath. I prefer to camp at the edge a of wood, where there is more light, a view other than just trees, and a greater sense of security. I pitched-up just before the sun went down. I had already eaten so hadn’t bothered with packing a cook-kit. Instead I snacked on bombay mix and chocolate, all washed down with generous swigs of Irish whiskey. 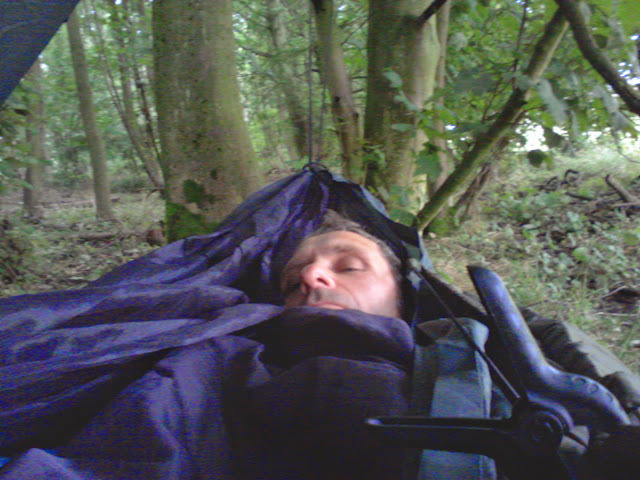 I sat back in the hammock listening to the roosting birds and light breeze curling through the trees. At 10pm, I undressed and slipped into my sleeping bag. Ah! So good to be in a hammock again, no more hard surfaces, comfort! What luxury. But of course, I hardly slept, my mind, well, part of my mind, refused to switch off. I tried more whiskey, no good, ate a little cake, no good. No sleep, pah! 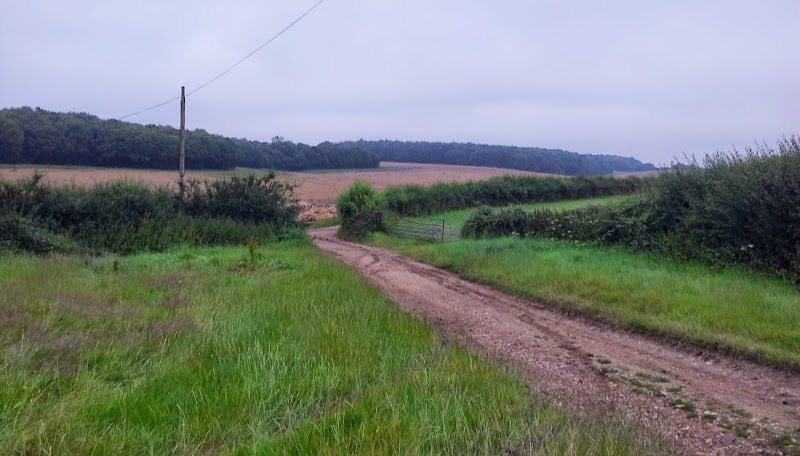 I finally dropped off at about 3am and was woken at 4am by the barking fox, after whom I named the wood. The fox mooched around a short distance from my camp, barking aimlessly for a good ten minutes or so and then stopped. I manged to get back to sleep for a bit but not for as long as I would have liked. Shortly before 7am I put a cuppa tea on and ate a muffin. 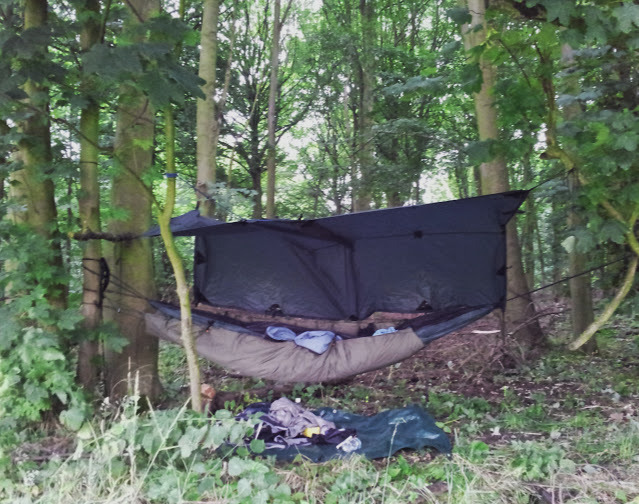 Despite the lack of sleep it felt great, wonderful, fantastic, to be in the woods again, it really can’t be beaten, as any wild camper will surely agree. 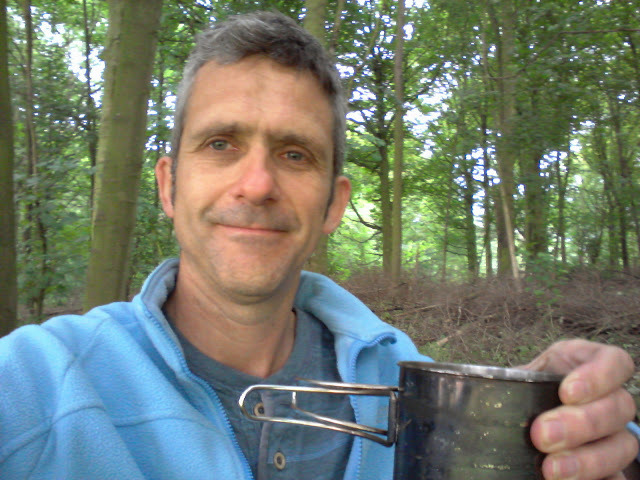 Tea in the woods, hard to beat. Refreshed (kinda), I packed up, leaving no trace. I thanked the wood for having me and made my way back to the sleepy Hertfordshire town where I hopped on the train back home. Martin, this is a great post. It reminds me of years past when I would do the same, or similar. Your description reminds me of how beautiful this piece-of-rock we inhabit is. Looking forward to more of the same. Hi Ross-Barry, glad you enjoyed the post. Looks like a great location Martin. It takes a lot of courage,to wildcamp in a forest,alone. Apart from the Dutch kind,of course,lol. I’m always worried a warden might turn up. But,I’m on the side of the wildcamper,like yourself,who leaves no trace. That’s where it’s at,Martin dude. Hi Killy, thanks for stopping by. It was a great location. I spend a bit of time talking myself into not worrying about anyone else. It’s far safer on your own in a wood than in an English town after the pubs close. Woodlands are especially beautiful in summer . Like the thought of the birds roosting . Potentially there is a huge crop of blackberriies this year so you won’t starve . One of the things I like most about hiking in late summer/autumn are the blackberries, free food! Glad you enjoyed the post. I didn’t want to take my wood burning stove as I was a little nervous about trespassing. Sounds like a knackering, if somewhat life-affirming experience. I get really frustrated when I go camping and can’t get to sleep, which is most of the time! Takes me ages to drop off, and then it gets light at some ridiculous hour and the birds start singing – not to mention the crashes and barks and other weird noises which echo around the countryside at night time. Good fun though, and I’m really pleased to see it’s not just me who is afflicted! Have been loads this year, and plan to do plenty more. Keep up the good work! Hi Paul, really glad you enjoyed the post. I’ll drop you an email with the wood’s location. I particularly like that you thanked the wood. I thought I was the only one that did that! Couple of weeks ago had a cold, windy overnighter. A long rough night. Generally OK but was glad to see dawn. As I was about to leave I felt gratitute to the wood for seeing me safe through the night and spent a bit of time thanking it. Also realising that anything I had cut or burned had been taken from it. As ever, I left no trace. Next time I am there I will plant some willow shoots to protect its future! We truely are only guests in the wooods. Hi Leigh, thanks for commenting and glad you enjoyed the post. Not sure where I picked up the habit of thanking the wood, I think I heard another wild camper say they did it and it just feels very natural and right. Cheers. Love the post! Some time ago now! Have you returned? Love your set up by the way, very nice. I’m in hertfordshire and trying to get some local places to head out too, would you be able to send me over the location?